Former NFL head coach John Madden is introduced during the induction ceremony at the Pro Football Hall of Fame Saturday, Aug. 3, 2013, in Canton, Ohio. 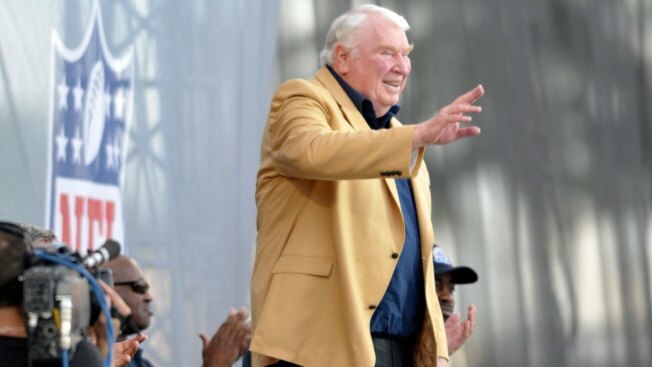 Hall of Fame football coach John Madden is "expected to fully recover" from open-heart surgery, the NFL said Thursday, and is frustrated he's off the field and away from the action. In a statement released by the NFL, the 79-year-old Madden, who lives in Pleasanton, California, was released from a San Francisco hospital Wednesday after undergoing open-heart surgery to repair blockages. He's expected to make a full recovery. "We are all pleased to know that John's procedure was successful and wish him a speedy recovery," NFL Commissioner Roger Goodell said in a statement Thursday. When he spoke with Madden after surgery, Goodell said, the former coach was doing "great" but was "frustrated about being on injured reserve" while he heals. "He is anxious to return to action soon doing the important work he does for our game," Goodell said. Madden served as head coach of the Oakland Raiders from 1969 to 1978 and is now a sports commentator. He was inducted into the Pro Football Hall of Fame in 2006 for his coaching accomplishments. He's also known for the Madden NFL video game series that bears his name, and the fact that he doesn't fly, but tours the country in a decked-out bus. "He’s a tremendous fountain of ideas and we can’t wait to get him back," Goodell added.